We know that any well-built site deserves a complete development plan that includes research and consulting, design, and development. You can expect to pay $150-$200 per hour for top-level talent. Here's the break down of costs of a custom web design so you can compare the process, the time spent on each phase and the end results. Research: We recommend about 20 hours for this stage of the process which includes industry research, design planning, strategy and consulting. You can go with more or fewer hours, depending on your budget. If you are OK with a two-hour initial meeting and then jumping right into the design process, that’s up to you. $1,000-$3,000. Design: The average site will need an average of 40 hours designing pages, usability optimization, styles, calls-to-action, interactive features, revisions, navigation and everything else that contributes to your brand identity. Sure, you can cut that down, especially if your site requirements are pretty simple. $3,000-$8,000 on average. We can keep the cost for smaller sites (under 5 pages) below $4,000, depending on how many unique design elements and how much time is needed for research and consulting. 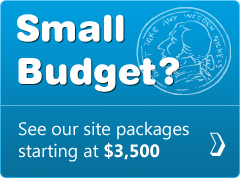 For smaller budgets, see our Value Packages which start at $2,500. Any established agency or web design firm will charge at least the amounts mentioned above. As such, be very cautious if the scope or rates vary much from these guidelines.